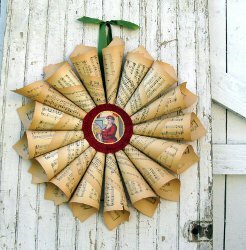 Hang a Decorative Vintage Paper Wreath from Mitzi Curi on your door this season! 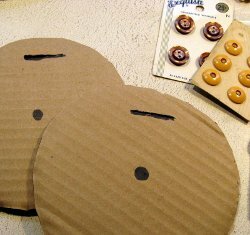 Try this recycled craft idea if you're looking for a fun project. There's more than one way to roll a cone, and my favorite way was discovered through trial and error. Whatever you decide on, try to be consistent and roll somewhere between 15 and 20 cones in your preferred cone-rolling method. I began by securing mine with a glue stick, but later discovered that using a bit of masking tape was easier. 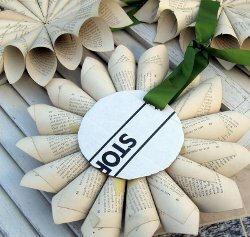 Next you need a cardboard circle that will serve as the base of your wreath. Mine were about 9" in diameter. Draw a belly button in the middle of your circle, and cut a slit for the ribbon hanger. In the picture below, I highlighted the slit so you can see it. Select some ribbon and thread it through the slit and tie in a knot or bow. You can make a big deal out of the hanger ribbon and bow, or make it small enough so that it can't be seen once the wreath is completed. It's totally up to you. 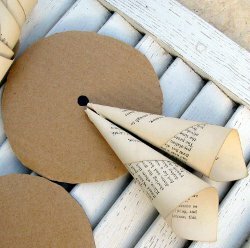 Now you can start hot gluing the cones to the cardboard circle, using the belly button as your center point of reference. Once you have your cones glued to the base, you need to create a center medallion or decoration. I selected an image of Santa from the Graphics Fairy. I printed it out on cardstock, then glued it to a circle of manila folder to make it a little stiffer. I used glitter glue around the edges to add some sparkle. I also glued a ruffle that was sewn out of crepe paper on the underside. The lovely red ruffle was found in a box of crepe paper, and I just love it. 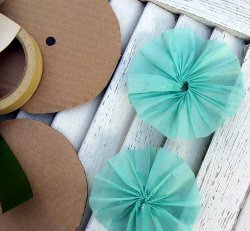 Of course, you could make your own ruffle, or substitute gathered fabric or lace. 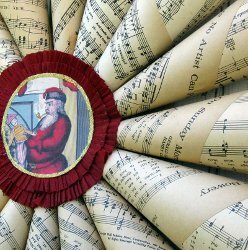 My other wreath was made with smaller size book pages rather than sheet music. 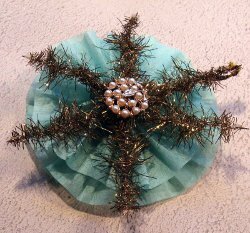 The center medallion was created by sewing crepe paper into two rosettes, then adding a vintage tinsel ornament in the center. Last, I added a piece of vintage costume jewelry to the center of the tinsel star. I have seen these for a few years, but never made one...I do think it may be time for me to try it and this tutorial is the best one I have ever seen. I love the idea of a vintage image and the ruffled medallion in the center sets the image off in a very nice way. I like the other medallion she made for another wreath too. I may add some vintage style tinsel around the center medallion. I love this old style wreaths. The problem I have is keeping my rolls even. Someone had a tutorial up that showed how to use a pencil or a bottle to roll the paper around so that it is the same size, but I never can keep it straight when I glue it. Do you have any tips? You know I saw one of these with the sheet music at a auction sale in a very old house and thought it was absolutely beautiful and wondered where it came from. And now I see this tutorial on the exact one. 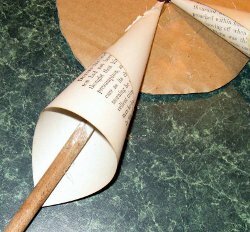 I would never image I could make one.And your idea to use a dowel rod to push the cone down and slide it in desired place is a clever idea. Must have one. Do you need to burn to get old antique look? that wreath is so beautiful, I want to try it for Christmas. This is awesome, I'm going to look for some music or an old book at a resale store to use. LOVELY wreath! how did you achieve the antique-look (kind of browned edges) on the sheet music?? it looks SO authentic!